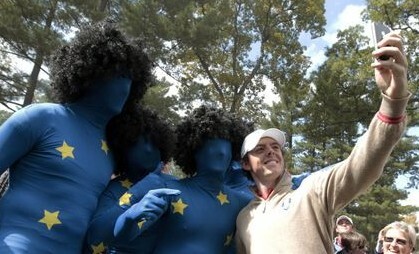 Rory McIlroy clowning with fans of Europe at the Ryder Cup. between Britain and Ireland. He represents both playing for Europe. Rory McIlroy's caught in a bind not of his own making (mostly, anyway). Golf is coming back to the Olympics in 2016 and he'd like to participate, but he has to choose between playing for Ireland or the United Kingdom. I generally steer clear of these topics that touch on nationality and Northern Ireland, but in this case I can't stop my American brain working on a possible solution. My American solution might not satisfy anyone in Ireland - north, south, Loyalist, Republican, Unionist, Nationalist, Protestant or Catholic - but might actually be a win-win for the sporting bodies involved. My idea revolves around television and money - could it be more American? - and is basically this: The Decision II. Do you remember the hour-long program a couple of years ago during which LeBron James (eventually) announced his decision as to whether he was going to remain in Cleveland playing for the Cavaliers or move to Miami to join the Heat? Do you remember that nonsense? At the time I thought it was the dumbest thing I'd ever seen, but ESPN knew better than me. Millions of people watched. It was the highest rated program on American TV that night. So there's the precedent. I would, however, tweak the James program somewhat. Rather than having McIlroy announce his decision I would go for a coin flip. Yeah, that's right - a coin flip. A flip of the coin will relieve McIlroy of making the decision himself, which he is clearly uncomfortable doing, or letting others do it for him. And using a coin flip will make the program genuinely suspenseful because even McIlroy won't know which team he is going to play for, unlike in The Decision. I can easily see how this could be played out for an hour on TV - with huge ratings in Ireland and Britain. But I suspect that McIlroy's choice could even be pretty big television in America and that would make it a financial gold mine. Big ratings and millions of advertising dollars rolling in. The program will be a winner for whatever network gets the rights, but McIlroy will be due a substantial fee. This is where the win-win comes – McIlroy donates his entire fee for the program to the Olympic committee of the 'losing' nation. He hardly needs the money now that he has his new $200m contract with Nike so donating his fee will be fairly painless for him. Yet the amount should be big enough to be a substantial boost to either the Irish or even the UK Olympic committee. He could even go further and donate his sponsorship money from participating in the Games. By donating his money to the 'losing' nation's Olympic committee McIlroy will soften the blow for those who will be disappointed to see him wearing the 'wrong' colors in Rio. Of course, there is one other possible American solution: McIlroy could take out American citizenship and play for the United States in 2016. By so doing he will annoy everyone equally in this part of the world (while simultaneously enhancing his own financial bargaining position with sponsors in America). Just consider the headlines and the build-up: 'Olympian Rory McIlroy from Holywood to Hollywood.' What a fairytale!